I guess my story begins with this quote from Leonardo DaVinci. It was a beautiful afternoon in late November. Trees had shed their last leaves, warm sunshine blazed through clouds, and winds breezed through my hair. I had visited Cross Keys for the first time to make my tandem jump, and it was absolutely the most exhilarating experience of my life. I still remember the moment like it was yesterday, when the door was opened, cool air rushed in, and I looked down from the door of the flying airplane. I'm not going to lie, it was scary! My heart began to beat faster, my mouth got dry, and my palms got sweaty. My instructor counted down... and we jumped! I never had a moment in which I was so excited and frightened at the same time. All that I could do was feel the amazing sensation of soaring through the air. The entire free fall humbled me to the expanse of the world beyond me, and it showed me another long, healthy, and beautiful perspective of this world. I knew that I would come back again as soon as I landed. And yes, I did! I started my AFP student program right away in December. I scheduled my ground school, spent many days at the drop zone, and many hours pouring over the training materials. On a sunny Tuesday in December, my instructor and I went up to 13,500 feet for my first AFP jump. It was this time that I could finally confront the door of the plane, and see what I was made of! That was also the day I had my REAL experience of skydiving. It was exhilarating, powerful and life changing, all at once. Stepping out that door of a flying airplane terrified me at the beginning. The feeling was surreal and overwhelming. I asked myself if jumping out the plane was what I truly needed to do to make myself happy, if skydiving was truly redefining who I was meant to be. The answer was, obviously, YES! 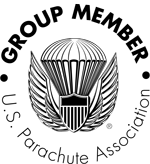 As an unexpected side benefit, a very important one, were all the incredible people I met along the way that I now call family: my dropzone instructors, coaches and other jumpers. They come from different walks of life, and every one of them has a unique story to share. But, united by the passion for the sky, the whole skydiving community treats each other like close family. I gained so much love and encouragement from each one of them. They walked by my side when I was in the shadow, pushed me forward when I held back, and picked me up when I fell. They helped me realize that every skydiver faces the fear, they jump out of a flying airplane on purpose, for a reason, to connect with their true selves, touch the spirit of freedom, conquer their fears and discover the trouble-free, liberating sensation of flying. With all the love and support, I kept moving forward, kept breathing and kept focusing on the maneuvers I had been trained to do. My jumps were where I found my peace and confidence. I finally could feel relaxed as I was flying through the sky; my heart was still pounding and shaking, but I started noticing the bluest of skies, the beautiful arch of our planet and the glowing sun in my eyes; it was truly amazing. That was where I realized that I was not fighting the wind, gravity, or nature, but just the fear that was inside of me. When I conquered this fear, broke through that barrier and let go, the entire experience got much easier and more interesting. I ended up with my "A" license in March. That was the time that I became a BABY skydiver. My heart smiles harder and my soul gets stronger. Skydiving allows me to trust myself, release myself, and to be myself that I haven't been in years. More importantly, I am embraced with more true friends who have become my brothers and sisters, and I found a place where I am not from, but have come to call “Home”. Skydiving is a beautiful addiction, and it is more than a sport. It is something about the attitude, which requires dedication, willpower and perseverance. This spirit will remain in our blood wherever we go. "Above the surface of the clouds, a whole new different world exists, for those who let go their fears, this world is a reality, a freedom and a gift"- Unknown.